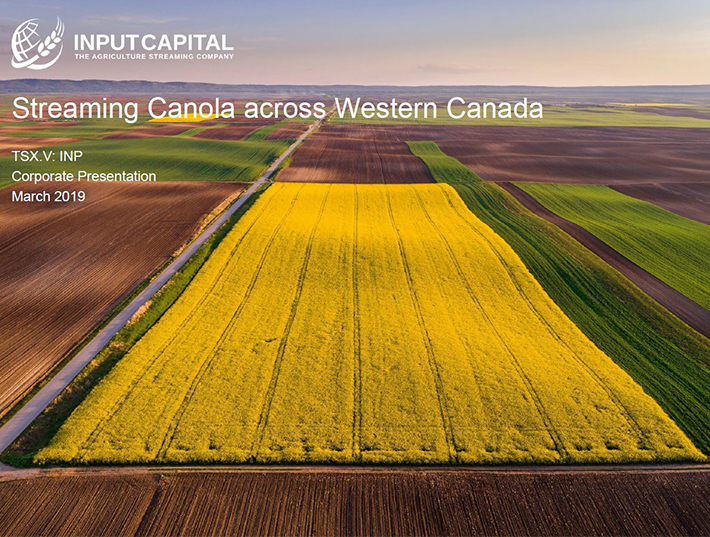 REGINA, April 18, 2017 /CNW/ - Doug Emsley, Chairman, President and Chief Executive Officer of Input Capital Corp. (the "Corporation" or "Input") (TSX Venture: INP) (US: INPCF) and Emsley & Associates (2002) Ltd. ("Emsley & Associates"), a corporation which is owned 50% by Mr. Emsley and 50% by Tamara Krueger Emsley, have announced that today, Emsley & Associates acquired from XL Value Offshore LLC ("XLVO") 3,000,000 common shares of the Corporation representing approximately 3.7% of the outstanding common shares (the "E&A Transaction"). Contemporaneously with the E&A Transaction, the Farquhar Family Trust (the "Farquhar Trust"), the sole trustee of which is Brad Farquhar, Executive Vice-President and Chief Financial Officer of Input, has separately acquired from XLVO 750,000 common shares of the Corporation, and Dalhousie Capital Corp. ("Dalhousie"), a corporation controlled by Gord Nystuen, Vice-President, Market Development of Input, has separately acquired from XLVO 500,000 common shares of the Corporation. In the aggregate, XLVO has sold 4,250,000 common shares of Input representing approximately 5.2% of the outstanding common shares (the "XLVO Transaction"). The common shares were acquired by each of Emsley & Associates, the Farquhar Trust and Dalhousie in their respective transactions at a price of $1.80 per share. The aggregate acquisition price of Emsley & Associates is $5,400,000, of the Farquhar Trust is $1,350,000, and of Dalhousie is $900,000, representing aggregate consideration to XLVO of $7,650,000, which amounts were financed by XLVO pursuant to loan agreements entered into with each of Emsley & Associates, the Farquhar Trust and Dalhousie. Each of Mr. Emsley and Emsley & Associates, Mr. Farquhar and the Farquhar Trust, and Mr. Nystuen and Dalhousie, respectively, acted independently with respect to these transactions. None of Mr. Emsley and Emsley & Associates, Mr. Farquhar and the Farquhar Trust, and Mr. Nystuen and Dalhousie, respectively, has any agreement, commitment or understanding with any other of them with respect to the acquisition, ownership, control or direction of the common shares of the Corporation that are the subject to these transactions. Immediately before the E&A Transaction, Mr. Emsley owned 254,627 common shares of Input and exercised control or direction over 7,453,820 common shares of Input owned by Emsley & Associates representing approximately 9.4% of the outstanding common shares. Immediately after the E&A Transaction, Mr. Emsley will own 254,627 common shares of Input and exercise control or direction over 10,453,820 common shares of Input owned by Emsley & Associates, representing approximately 13.1% of the outstanding common shares. Mr. Emsley also holds options to acquire an aggregate of 2,375,411 common shares of the Corporation, of which 1,939,109 are exercisable within 60 days. If such exercisable options were exercised: (i) immediately before the E&A Transaction, Mr. Emsley would have owned and exercised control or direction over approximately 11.5% of the outstanding common shares on a partially diluted basis; and (ii) immediately after the E&A Transaction, Mr. Emsley would own and exercised control or direction over approximately 15.1% of the outstanding common shares on a partially diluted basis. The E&A Transaction was entered into by Emsley & Associates for investment purposes. Mr. Emsley and Emsley & Associates may, depending on market and other conditions, acquire additional common shares of Input through market transactions, private agreements, treasury issuances, exercise of options, or otherwise, or may sell all or some portion of the common shares of Input that it owns, or may continue to hold the common shares of Input. Immediately before the XLVO Transaction, XLVO owned 13,636,074 common shares of Input, representing approximately 16.7% of the outstanding common shares. Immediately after the XLVO Transaction, XLVO owns 9,386,074 common shares of Input, representing approximately 11.5% of the outstanding common shares. The XLVO Transaction was entered into by XLVO in the normal course of its investment activity. XLVO holds common shares of Input for investment purposes and may, from time to time, increase or decrease its investment in Input through market transactions, private agreements, treasury issuances or otherwise at any time subject to applicable contractual restrictions and depending on market conditions and any other relevant factors. For further information and to obtain a copy of the early warning report filed by Mr. Emsley and Emsley & Associates under applicable Canadian securities laws in connection with the transactions hereunder, please see Input's profile on the SEDAR website www.sedar.com or contact Doug Emsley using the contact information below.